Feral cats are probably around even if you don't see them. Here's how to help them survive winter. As temperatures drop and winter weather becomes severe, feral cats are increasingly vulnerable to the elements. 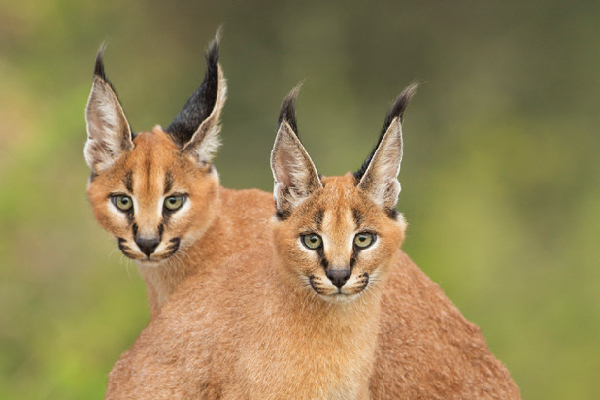 Lacking appropriate shelter, the cats’ ears, feet, and tails can become frostbitten, possibly leading to disability and infection. You can lend a helping paw to the cats in your neighborhood (they’re probably around even if you don’t see them) by placing a feral cat shelter behind your home or apartment building. 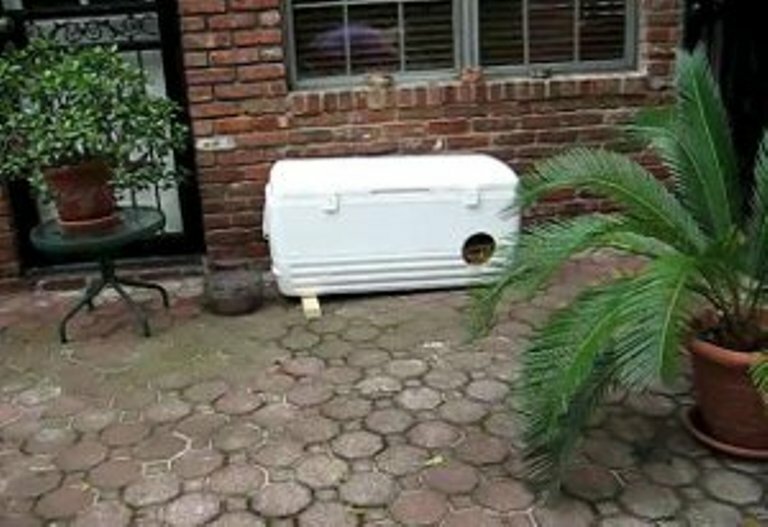 This cat shelter, via Neighborhood Cats, is relatively easy and inexpensive to build. Probably the simplest shelter design I’ve seen is via Neighborhood Cats, an organization dedicated to nationwide trap-neuter-return education and promotion. 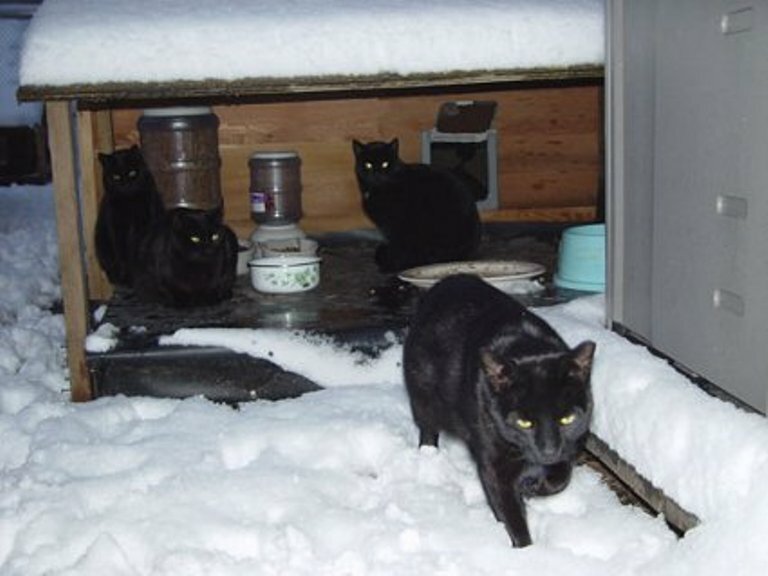 A shelter and a heated water bowl can be lifesavers for feral cats in the wintertime. Photo via New York City’s Urban Cat League. Cut a doorway in one of the long sides of the storage bin toward the corner. To prevent flooding, cut the opening so that the bottom of the doorway is several inches above the ground. Line the floor of the bin with a piece of polystyrene, using the yardstick and box cutter to cut out the piece. Line each of the four interior walls of the bin with a piece of the polystyrene. Leave a uniform gap of at least three inches between the top of these polystyrene wall pieces and the upper lip of the bin so the interior polystyrene roof will fit. Cut a doorway in the polystyrene that lines up with the doorway cut in the storage bin. Stuff the bottom of the bin with straw or other insulating material to hold the polystyrene interior wall pieces in place. Styrofoam packing boxes make great cat shelters and can be gotten for free at many restaurants. Photo via Urban Cat League. Here’s a possibly cheaper polystyrene option from Animalkind Inc., a nonprofit rescue organization providing TNR and low-cost spay/neuter in Hudson, New York. Get free polystyrene packing cases from a restaurant. Line the interior with contact paper to prevent the cats from scratching the polystyrene walls. Saw an entrance hole at one end. Cover the edges of the hole with duct tape. Seal the cover back on using silicone sealant (and a caulking gun). Turn it upside down so that the bottom of the case becomes the roof. If desired, paint the outside of the shelter. 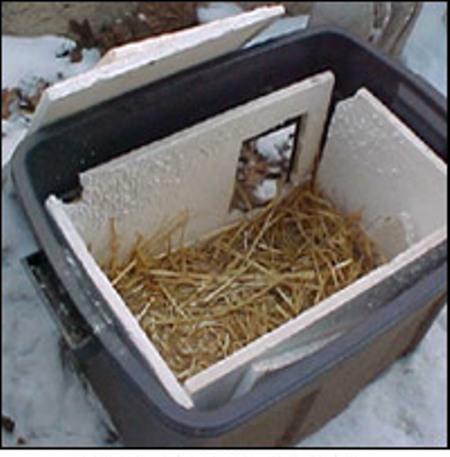 Pack straw inside so that the cats can “burrow” in the insulating straw. 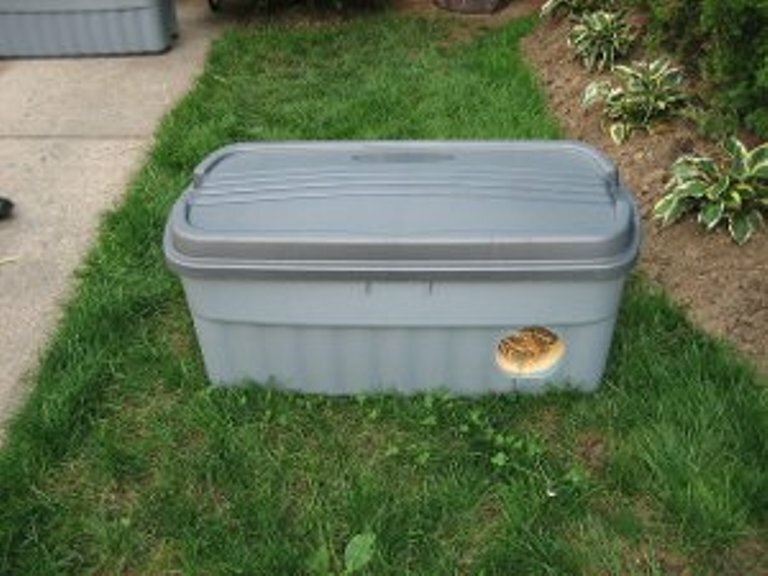 Rubbermaid storage bins insulated with styrofoam and straw can provide cozy quarters for your neighborhood’s strays. Photo via Urban Cat League. Have some disposable income? It is worth sniffing around Etsy, where you can find cedar feral cat sanctuaries with heated beds or ones that look like cute, well-designed miniature homes. These cost from $120 to $500, though, so when it comes to feral cat shelters, it might be DIY FTW. 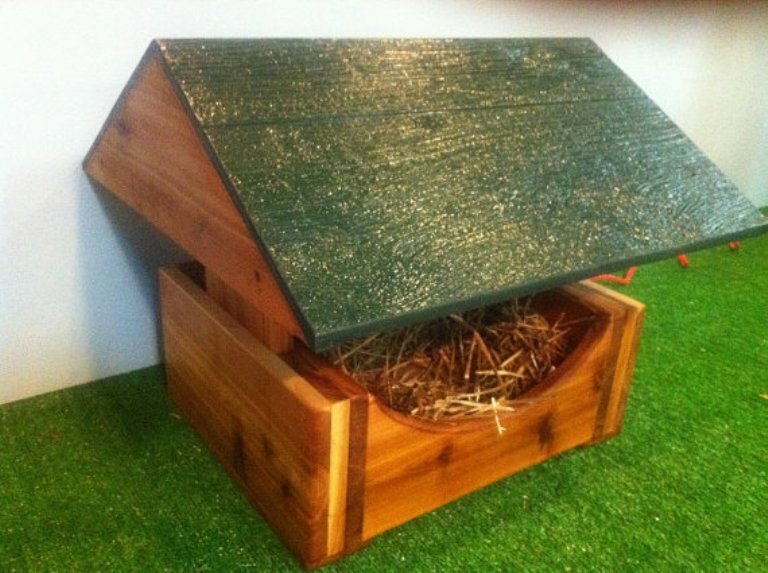 This amazing, heated cedar cat house is available via Etsy. The Urban Cat League feeds and cares for ferals in New York City. It offers illustrated instructions on how to build cat shelters out of materials including polystyrene fish and steak boxes as well as plastic storage bins. Not comfortable using power tools? Most of the shelters the group suggests are also available for purchase. Build your cat shelter on stilts or attach it to pieces of wood so that snow and rain will not bury the door or inundate the shelter. Similarly, cutting the entrance several inches from the base of the box can help prevent flooding. Include two holes in the shelter — an entrance and an emergency exit, so cats cannot be cornered by prey. Shelters with lids make the interior more accessible for cleaning or tending to an injured cat. Heated water bowls cost $15 to $50 on Amazon and can help feral cats survive a long, cold winter. Sprinkle catnip inside the shelter to attract the cats. Place rocks or something heavy atop lighter shelters to weigh them down. Be sure to use straw — not hay — for insulation. In fact, straw is pretty much ideal, because it repels moisture and is tough, lightweight, and inexpensive, and it allows cats to burrow. It is also easy to clean and replace. Straw is available for purchase at most garden centers. 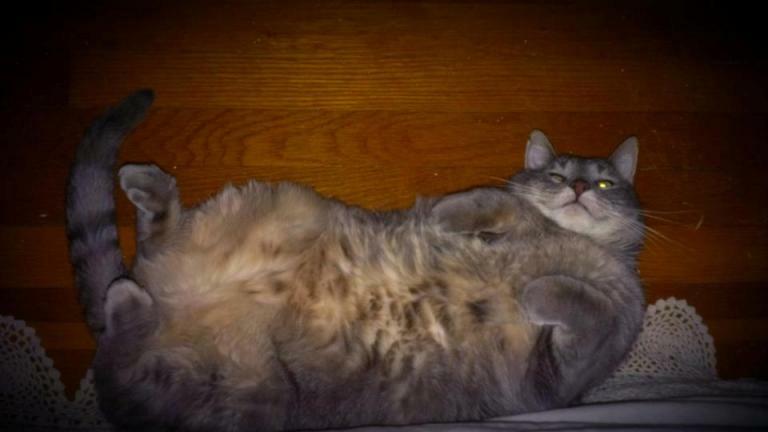 My cat, Bubba Lee Kinsey, takes up his winter post by the heater. All cats should be so lucky! Have you built a feral cat shelter? How are you planning to help the strays in your neighborhood this winter? Share in the comments!